The capital of Colombia is Bogota, and it truly is a place that takes time to warm up to. I love the city, though, and I am completely horrified to hear that some tourists and backpackers only ever pass through the capital en route to other cities. There are so many things to do in Bogota and they won’t mess up your strict travel finances, either. Here’s my list of my favourite things to do in Bogota, even if you’re on a budget. La Candelaria is the historic centre of Bogota. It eclectic, colourful and full of musicians, artists, backpackers and university students. There are loads of cafes, restaurants and bars, so when you’re not snapping photos of the colonial-style buildings, you’ll probably be on the hunt for somewhere to sit down with a drink to rest your legs and people watch. The Botero Museum is one of the many free museums both locals and travellers can enjoy while in Bogota. Hailing from Medellin, Fernando Botero is one of Colombia’s favourite artists and is known for his larger-than-life depictions of people, animals and public figures. If you want to be blown away by the sheer wealth the catholic church has, then a trip to the Museo del Banco de la Republica is a must. Ask the security guard where La Lechuga (The Lettuce) is and get ready for a spectacle. It’s actual name is the monstrance from the church of San Ignacio in Bogota, but the lettuce is more fitting. It is a piece set with more than 1,485 emeralds. It’s a shimmering gold and green mass of opulence that you’re definitely going to want to take a photo of, but forget about it, because photos aren’t allowed and the security guard will let you know it. The Plaza Bolivar is probably the place with the most social, cultural and political significance in Bogota, if not Colombia. This is where the fight for independence against the Spanish was ignited, this is also where the M-19 attacked the Palace of Justice in the ’80s, it’s also where the mayor’s seat is, in the French-style building called the Lievano, and the president just lives around the corner, too. If you’ve got limited time in Bogota, but you want to learn as much about this eclectic city as possible, then you can’t go past the Bogota Graffiti Tour. This is such a wonderful, eye-opening introduction to the country, its political history and its hopeful future. You’ll come across a lot of graffiti while travelling through Bogota, and it really makes a difference when you know the message behind the imagery. What’s great about the tour is it’s by donation, too, so jump to it. Watch the video about the tour, here. One of the most magical things I experienced during my trip to Bogota was our day trip out to Lake Guatavita. This is where the story of El Dorado and its buried treasure originates, but it’s also a spiritually significant place for the local indigenous group called the Muiscas. Our tour really invited us to feel and experience the magical energy of this area, and it’s something I won’t likely forget. Find out more about the tour I did, here or watch the video. The Salt Cathedral of Zipaquira is a must-visit while in Colombia, too, it is visually spectacular and moving, even if you’re not religious. Zipaquira is about an hour from Bogota, but it is most definitely worth the trip to see this architectural marvel. Food lovers in Bogota, listen up! You can’t possibly go past Loon Lio’s Bogota Food Safari while you’re in the capital. I was lucky enough to join one of the food tours while I was in Bogota recently and, boy, did we come across some delicious food. From fish soup and arepas, to spiky fruit and desserts, by the end of the tour I was ready for a sleep in a hammock in the sun somewhere. Check out a video of the tour, here. One of Bogotá’s most impressive monuments might simply be referred to as a church on top of a hill, but it is so much more than that. Shrouded in superstition and an important place of pilgrimage, it’s said that any woman who brings her boyfriend to visit the church of the Fallen Lord, which sits atop the mountain, will never, ever, marry him. So, if you’re superstitious, maybe steer clear of Monserrate with your partner until you get hitched. If you happen to be in Bogota on a Sunday then you’re in luck, because the Gold Museum entry is free. But even if you’re in Bogota on a weekday, the tickets are only $3,000COP and there are several rooms of artifacts made of gold. Try and walk through this place without being impressed. It’s impossible. You’ll also be taken on a journey throughout many regions of Colombia and learn about the indigenous groups which populated each. This place is a local favourite, and now tourists are catching on, too, and for good reason. La Puerta Falsa has been serving delicious food for generations and it is well-priced. My tips is to order the tamales, an ajiaco and a chocolate completo to share with one or two friends. If you’re looking for things to do in Bogota, make sure you skip a meal and go hungry. It’s delicious! It was a fight over a flower vase that caused the riots and signaled the beginning of Colombia’s fight for independence and you can visit the spot where it actually happened – the Vase Museum, or the Museum of the 20th of July. As well as the vase, you can see more than 2,000 pieces that relate to Colombia’s independence. What an experience it is to visit the place that actually sparked the revolution and subsequent independence in Colombia. You really can’t go to Bogota without visiting Andres D.C or Andres Carne de Res at least once. They’re not just restaurants, they are destinations in and of themselves. Andres D.C. is in Zona Rosa, while Andres Carne de Res is in Chia, which is a suburb outside of Bogota. Both are definitely worth the visit. Take a big group of friends, put on your dancing shoes and be prepared to feast of some Colombian food, followed by a night of dancing salsa and merengue. The Andres D.C. restaurant is five levels of entertainment. Once you step in, you’ll think you’ve walk into a mini carnaval. There’s confetti, parades, cocktails, crowns and sashes that will surely make you feel like you could be part of the Miss Colombia contest. 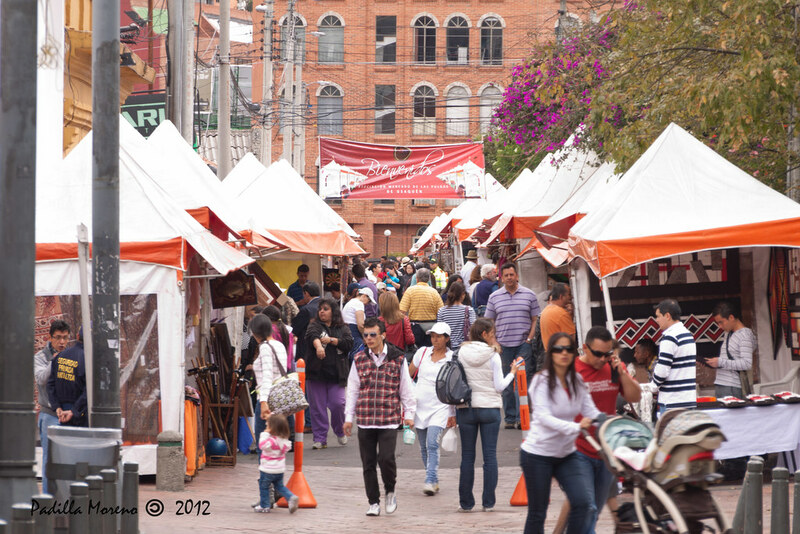 Usaquen is in the north of Bogota and apart from some pretty swanky restaurants and cafes, there is a bustling market that brings the place alive on Sundays. You’ll find everything from bags and jewellery to cupcakes and juices. It’s quite the place to spend a lazy Sunday afternoon if you’re looking out for things to do in Bogota. Where else should people visit while they’re in Bogota? Share your thoughts and tips in the comment section below. If you are in Bogota in October, dont miss out on the new Candelaria ghost tour from Tours of Colombia! Head on over to http://www.toursofcolombia.com to reserve your spot for this spooky tour with scary stories and fun horror movie trivia! A great way to start your night with a fright! Thanks for sharing, James! I hope it is an awesomely spooky tour!! Wish I could be there! Museo Nacional del Prado? That’s in Madrid! La Lechuga was exhibited there only for a few months earlier this year. Go to Museo del Banco de la Republica in Bogota to see the piece as well as other great art from Colombia. Well I feel like a bit of a doofus. Thanks for that, Brad! Excellent list. I myself enjoyed the gold museum. Good blog- hope you High Altitude- A Taste + Feel of Bogota, Colombia like this entry about Bogota as well! It’s been great reading through your blog, when I think of Columbia, the first thing that comes to mind is Emeralds. I bet you see them everywhere in Bogota. Also, are there many white sandy beaches like the island of San Andres? Thanks so much for getting in touch. And you’re right, Colombia is well known for its emeralds and there are quite a few spots to buy them in Bogota, too. If you love beaches, there are loads in Colombia. There are actually around 300 beaches on both the Atlantic and Pacific oceans. There are a whole bunch in Tayrona Park, Rosario Island and Baru, but you might want to take a look at this post of some of the lesser-known beaches in Colombia – http://www.sarepa.com/2015/05/18/colombian-beaches/ Enjoy! One thing I miss, strangely enough, from Colombia is the food. While I was there I didnt think I could eat another Arepa ever again but I wouldn´t mind one now. Ajiaco is delicious as well as Lechuna and the Tamales. Another thing everyone should do while in Colombia is learn Salsa! A good place is http://www.bogotasalsaschool.com. Colombian food gets a bad rap, but it’s just so comforting, isn’t it? And thanks for the tip about the Bogota Salsa School! Your link for the Guatavita tour is to a company that charges $128 per person. That’s “budget” travel?